I'm not renewing my membership to the RHS (Royal Horticultural Society). Here's my top five reasons why. A yearly subscription for one person is now £55 or £41.25 if you sign up as direct debit. As a renewing member though, it would be £47. This is expensive even if you have a job (well above minimum wage that is). I called to find out if they offered reduced rates for the unemployed or low waged. No, they don't. So I cannot afford to renew my subscription now I'm not working. I guess they don't want poor people visiting or making the most of their 'benefits'. It's alright, has some interesting articles occasionally. But the focus is on big gardens, people with money. I'm finding myself increasingly alienated by what I read in the magazine. Even when they do focus on small gardens, I a) question their definition of a small garden (1 acre isn't small, 7m x 5m is small, a balcony is small); and b) find when they do include a small garden, say courtyard size, it's almost always of someone who has lots of money to spend on design, materials and plants. As alluded to in point 1, I question the 'benefits' of being a member. *So you get the magazine, which is interesting enough, but as I said, focuses on big gardens etc. *You get to visit their gardens for free as many times as you like during the year. Great if you live close to one, which I don't. Or you can access one via good regular public transport, which is unlikely (see 5 below). *You can visit partner gardens. Great. Oh, wait. I discovered (personal conversations) that some partner gardeners run at a loss on they days they take part in the RHS partner scheme. They can get lots of visitors on that day, demanding visitors that though they got in for free, are horrified to find they have to pay for a cup of tea, and and complain about the cost of plants, as apparently £4.50 for a good quality plant is expensive (it's not). I don't feel comfortable knowing that my visit might negatively impact on the garden I'm visiting. So finding it hard to see this as the benefit I once thought it was. Instead of seizing the opportunity to include public transport access as a key part of their planning criteria, they will 'encourage' individuals to visit by public transport. If you aren't putting public transport access at the top of any criteria, you aren't encouraging people, you are passing the buck. And no, an hourly bus service is NOT good access to public transport. Anyone who has ever waited for an 'once an hour' bus will know that they are not reliable and you can end up waiting for another hour. As a current example, you can visit RHS Harlow Carr and get a bus from Harrogate Bus Station. Yay. Oh, wait, it only runs once an hour. And not on Sundays or public holidays. Hummmm. I was advised on Twitter that they would look into what part public transport plays in their key criteria and get back to me. So will state up front, that if public transport is part of the key criteria, AND once open clearly has good public transport access, I will publicly apologise (on this Blog and on Twitter). I say once open as stating that it's a key criteria and seeing it publicly realised are two very different things. "...identified the need for good public transport links with, in addition, opportunities to work with other local attractions to see if we can run joint transport 'ventures' sustainably to all locations. This is a key part of the criteria when choosing our 5th garden." It's a pity this wasn't mentioned in the article in The Garden. To me, the fact that it wasn't, and that I had to go searching for it (no link in the article to say 'read full criteria here', for example) still suggests that public transport isn't as a key criteria as other key criteria. As I said, stating that it's a key criteria and seeing it publicly realised are two very different things. I really hoped to be proved wrong and be forced to issue an apology. I think this is enough reasons to be going on with. Do you have anything to add? Please leave a comment below. You're absolutely right on all these points. Regarding your last one, I don't think you should have to apologise. This stuff should be at their fingertips, if they genuinely care about it. The very fact that it isn't, is telling in itself. If encouragement of sustainable transport methods is a genuine priority, rather than hot air, then details about it should be front and centre. They were pretty forward about stating their reliance on the road network, so it's not as though they're being cagey by default: just about stuff they haven't set time aside to issue press releases about. Decisions on what information to prioritize sends messages, and gives us glimpses into otherwise internally confidential priorities that organizations would prefer us not to know about. When the local council here was quizzed at a public meeting on how much money it was setting aside for cycle infrastructure, the council leader couldn't answer. This was at a public meeting where the very point was budgeting for different modes of transport, and where they'd had time to specifically research things like that. You could bet, though, that they'd be able to reel off the figures for the white-elephant and ultimately cancelled bypass-alongside-the-bypass, though; the big vanity project we residents managed to squash. Just not the cycle infrastructure that they, like RHS on Twitter, claim to want to encourage. As you say, "hmmm." A message. A glimpse into priorities. It has the feeling is of not wanting to be inclusive to all the citizens of the UK. No riffraff here please. It looks like you've put a lot of thought into your decision. If it wasn't for the partner gardens (primarily Westonbirt Arboretum), I wouldn't continue with membership. I'm currently on student rate, so it makes it a reasonable price. I find the magazine to be a very dry read, so to me, it's not a beneficial part of the package! Re Tim's comment - for those who are not full-time students, it's worth considering joining Westonbirt as a Friend instead of joining the RHS, especially if there are 2 of you. It's normally cheaper than joining the RHS (when no RHS special offers), and while RHS membership only gives 1 of the joint members free admission to partner gardens, both joint members of Friends of Westonbirt get free admission to all the RHS gardens (as well as several other partner gardens including Kew and the Botanic Garden of Wales). Garden Organic membership is also cheaper than RHS membership, and also offers free admission to all RHS gardens (1 member only) and free or reduced admission to various other partner gardens. We are members of GO and Westonbirt but not of RHS, and I must admit we do visit a lot of partner gardens but we nearly always buy tea and cake if available, and often plants too! I agree with Juliet's comment. Prior to becoming students, we were Friends of Westonbirt, but as students it became much cheaper to join the RHS. I do like Westonbirt and visited several times when I lived in Oxford and loved it, but sadly living up here in Yorkshire makes joining not practical. I'm a member of the Heritage Seed Library but no longer Garden Organic. Again I had to cut back financially & I felt the HSL was more important to support. I may rejoin GO in the future when funds allow. Part of the problem with even concessionary rates is they often want proof of your status and whilst I'm unemployed/long-term ill, I'm not on benefits because I don't meet the criteria. So I cannot prove I'm unemployed. I did join the Hardy Plant Society though (£17), which has a good journal which suits me as I like more indepth detail about hardy plants. Plus joined locally (£5) and get access to lots of free lectures (really good lectures with top speakers) and visits to private gardens that are not otherwise accessible. I love these aspects as I am actually meeting other plants people and able to talk and learn about plants and growing in wonderful detail with really friendly people. Plus I've become a Friend of the Botanical Gardens in Sheffield, which also has great free lectures and supports a garden that is open free to the public. In general, there seems to be a lot less here up North when it comes to joining one thing and getting free or reduced access to others. If anyone knows of any, let me know! Thanks for helping me to focus my own thoughts on the RHS. Living in Wales, I'd sort of hoped that the new garden would be more my way. Fat chance. And apart from the RHS Cardiff Show, all the RHS shows are a pain to get to. I'm a pensioner. I would need to remortgage to fund the cost of getting to any RHS location, show (apart from Cardiff) or garden. I will probably not renew membership next time. The May edition of Gardeners' World magazine will have it's annual 2-4-1 offer, no doubt. A magazine's a lot cheaper than £50! I'm so sorry to hear that you're jobless, which must make lots of other things difficult too. And - yes, many organisations manage to charge differently for different people, so you'd think the RHS could. I think you raise interesting points - what would you think about offering it to thinkingardens (me!) to appear later on (about Chelsea time?) ? I'd love to publish it there. It's the ME that means I cannot work, but amounts to the same, i.e. that you are excluded unless you earn well above minimum wage. I'd be very happy to offer it to thinkingardens. If it helps get the conversation going, maybe RHS might finally start to take notice. I'd forgotten your ME, which only makes the whole thing worse. Excellent re thinkingardens - would you email me (anne@veddw.co.uk) and we'll set it up? Thank you. Would be interesting to know how many people are affected by the same issues. 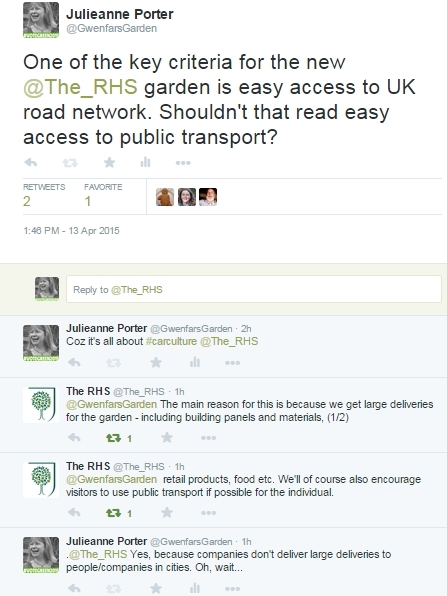 Hi - a perfectly understandable response and worth sharing with the RHS as it gives them invaluable feedback. I went through a similar exercise a few years ago when my year's gift subscription was due for renewal. I made the opposite decision - I value their independent scientific research and the Award of Garden Merit scheme which benefit all gardeners. I live further than you do to an RHS garden, so I use the partner garden scheme quite a lot. I must be the opposite to most visitors using this scheme - I so love getting in for free, I end up spending a lot more on plants and refreshments. However, that only works for gardens who have that kind of facility, it's a pity that it can't be made to work for gardens of good quality that can't or have decided not to go down that more commercial route. I had thought about whether to email them to say this is why I'm not renewing. I was reluctant as the last time I sent in a mild complaint they didn't respond at all (I resent just in case it got lost the first time but no response to that either). But it will only take me a couple of minutes to email them and link to my blogpost, so I will. I kind of deliberately focused on the negative as that was the point of the post, but will concede that maybe it would have been worth mentioning a couple of positives too. I agree that the AGM scheme & research is worthwhile, but the other issues considerably outweigh the good, in my view, hence my focus. I do like freebies, but not at the expense of others. For large gardens that are part of the scheme who do have the infrustructure (cafe/refreshments, nursery/shop) I can see that it benefits both RHS & the gardens taking part. As you say, people will spend in the cafes and shops and they will recoup money that way. But for smaller gardens who don't or cannot do this, the benefits seem to be for the RHS only. It would be great if they could work out a different scheme for those that cannot go down the commercial route. From the personal discussion I had with a couple of gardens about this (which is how I became aware of the issue in the first place), apparently the RHS didn't respond positively to such a suggestion. Hopefully they will in the future, as the partner gardens scheme is a great idea in theory, just the practice needs sorting. It's a good post gives a breakdown on some of the benefits of membership she found. Unfortunately I'm stuck at the first post as I cannot afford to rejoin (my point 1), even if I was willing to overlook the other issues I raised. Thanks for the link :) It's a shame you' didn't get a response to your complaint, that's really not on. 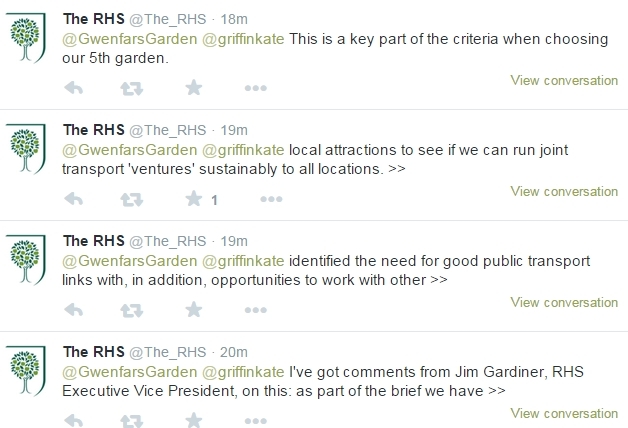 However, it's still worth trying again as you're raising important issues - I see you've included the RHS in your tweets as well. Fingers crossed you get a reply this time. I didn't get a reply to this either http://thinkingardens.co.uk/editorial/goodbye-and-thank-you-to-the-rhs-by-anne-wareham/ - they don't feel a need for good pr, I think. The worst bit of being an RHS Partnership Garden when you're not commercial is the smug delight of RHS members when handing you their card. Snap! This is exactly why I switched from RHS membership to Garden Organic membership. In particular, I felt The Garden magazine wasn't really for ordinary people like me who don't have acres of garden and pots of money.